You hear it more and more. "Oh, you can't plant that. It's invasive!" "That wildflower may be pretty, but it's prohibited! It's not native and its a noxious weed!" As with everything else, a little education is a dangerous thing. But this subject is serious. There are some plants—and a few of them are wildflowers—that are real problems. They are the ones that actually degrade our environment, and should be regulated. But don't listen to self-appointed zealots, since almost everything you may hear is full of misinformation. Here are the facts. What exactly is a "Noxious Weed?" 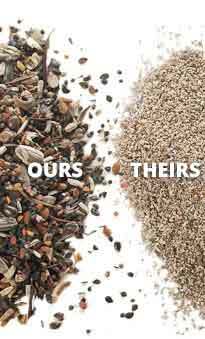 For years, countries and many of our states have made efforts to reduce the spread of certain plants deemed "noxious." This means, in some state's documents, "Plants that are injurious to the state." This has often meant the subject plant is detrimental to crops, livestock, and in more recent years, "injurious to the environment". This usually describes a pest plant, usually invasive, which moves into certain areas (wetlands, rangelands, etc.) and crowds out other native species. Most states have complied, and created their own lists. To begin with, three states simply adopted the federal list, and then set about adding their own additional weeds. Most states began from scratch, and have set up mini-bureaucracies to create "Action Plans". Many "State Weed Councils", or "State Weed Agencies" are now studying the subject. Each state is challenged to study the state's plants, map the state for "noxious weeds," publish a list, and then try to create a process to eradicate or at least slow or stop the spread of listed noxious weeds. Some regulation has been passed, mostly concerning efforts to stabilize the noxious weed populations. For example, many states have penalties for importation of more or "movement" of these plants within the state. In other words, the movement of a species from one place in the state to another (which leads to propagation and spread) is usually prohibited. To be a good environmental steward, you should not plant or propagate the listed weeds of your state, and reputable seed companies, whether in your state or outside, should be aware of all state lists, and not sell the seeds of listed species into the states listing them. Keep in mind that a plant listed as "noxious" in one state may be welcomed and actually useful in another. So it remains a complicated subject nationwide. All noxious weed lists are heavy with the common roadside, garden and pasture weeds we all know, including many grasses. Very few species considered wildflowers are listed, and when they are, it is important to distinguish between the ones listed as "noxious weeds", and the ones for which the importation of seeds is actually "prohibited." (See below. Many people confuse the two lists. ) However, in some ways, the result is the same. Being on either list clearly sends a signal that this particular species is not wanted in this particular state. If a few plants considered wildflowers make it onto the noxious weed lists, they are almost always from same group mentioned below under "prohibited plants and seeds." But try to keep it straight. A species may be listed as "noxious", but the seed may not be actually be "prohibited." And vice versa. A completely separate grouping of problem plants is listed by each state, usually in their seed statutes. These state laws have been around for a very long time, and they remain an amalgam of old agricultural and livestock protection rulings plus newer environmental concerns. Prohibiting seeds (and/or plants) from a state (or country, for that matter) have always been a somewhat efficient method of control, since seed companies shipping across state lines can be held accountable for enforcing the regulations. Agriculture Canada, the agency in that country regulating seeds, has a very active prohibition program, and inspects most all shipments entering from any foreign place, including the United States. Our 50 states vary widely in what they prohibit, and how rigidly they enforce their rules. California is famous for its border stations that actually conduct inspections of incoming Americans from other states for seeds and plants. These seed statutes are updated and changed periodically, and most clearly prohibit famous agricultural seeds such as thistles and various historic weed pests that are never considered wildflowers. However, a few wildflowers have made these lists, for various reasons in various states. Remember, being prohibited in one state has no bearing on planting the seeds in another. Prohibited in the States of Colorado, Illinois, Indiana, Kansas, Missouri, Montana, Ohio, Washington, Wyoming, and West Virginia. This is our common roadside daisy, established and loved in all 50 states. It does become invasive in many areas, so has been prohibited by more states than any other wildflower, mostly for agricultural reasons. It has been with us for hundreds of years, being one of the European weeds that were brought inadvertently across the ocean in colonists' crop seed sacks as they embarked on farming in a new world. 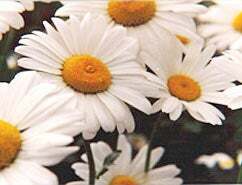 Alternative: If your state prohibits Ox-Eye Daisy, and you want white daisies in your meadow, plant the close relative, Wild Shasta Daisy, Chrysanthemum maximum, which is much less invasive, and not prohibited anywhere in the U.S.
Called "Wild Carrot" in England, this is another common wildflower that arrived with the colonists the same was as the daisy and others. Since it is so "successful" (that means it spreads rapidly and has staying power), it is considered a real pest in some states. It is a biennial. Queen Anne's Lace appears on various states' noxious weed lists. Alternative: If you particularly love Queen Anne's Lace, and many people do, try another species, Ammi Majus, usually called Bishop's Flower. It is an annual, looks much the same, and in fact, is often called "Queen Anne's Lace". This species has none of the invasive qualities of Daucus carota. This much-loved lilac-hued, cinnamon-scented wildflower is often called "Wild Phlox", but it is not a member of that family; it is a member of the highly "successful" mustard family. (Phlox species have 5 petals, mustards, only 4.) Few states have officially complained about this species, but it is known to be quite aggressive in the northern midwest. Also, Colorado recently added it to their noxious weed list. Prohibited by the State of North Carolina. One of many people's favorite wildflowers is this true blue beauty, also called "Bachelor's Button." So easy to grow, so beautiful in a vase, and so famous in gardens, it's a wildflower (native to Europe) many people really enjoy in their wild meadows. However, it is aggressive in the southeast, and one state, North Carolina, has actually prohibited it. Prohibited by the State of California. Not to be confused with the benign annual version of baby's breath, Gypsophila elegans, this is the perennial baby's breath used extensively in rose bouquets by the cut flower trades. It is also a popular dried flower. This perennial forms large, tough bushes as it ages, and becomes a pest in some California environments. No state has ever prohibited the annual Baby's Breath, which is a staple of many wildflower seed mixtures. This is the subject where there is the most misinformation of all. Many well-meaning people love to join in a "cause," but this is a really important one that is now completely out of control. Since this subject usually includes the discussion of foreign plants, one must know the terms. "Alien" and "Exotic" species. Beware the baby in the bathwater. When a botanist speaks of an "alien" or "exotic" plant, it simply means a species that is not native to the area in which it is growing; the plant is usually from another continent, but the terms are neither positive or negative. They simply mean the plant is an immigrant. Of course, there are some really devilish immigrant plants in North America, including the rapacious kudzu vine in the South that actually smothers other plants as it spreads (See Pest Species discussion, below. ), but keep in mind that thousands of foreign plants including every peony, most of the roses, and even all those fall chrysanthemums we enjoy are also "aliens" or "exotics," and they certainly don't threaten us or our environment in any way. But since most of our big problem plants, like kudzu, are foreign species, the uninformed have sometimes concluded that, even though it would be quite impossible, all foreign plants should be excluded. And in fact, some "experts", believing the public could never understand the whole subject, have actually written books, speeches and news stories that way. Aliens = bad; nothing could be further from the truth. As one wildflower expert writes in his book, "Political correctness has made its way into botany! And some among the public have swallowed it whole." Tossing out all foreign or "alien" plants would be as silly as banning all foreign foods from your table. Thoughtful gardeners understand all this. And aren't throwing out the baby with the bathwater. As the silliness of trying to ban all alien plants becomes more and more recognized, the attention is being placed on simply plants that are truly invasive, whether they're immigrants or natives. More thoughtful experts now always mention that such natives as the common goldenrods and cattails are much more invasive than many of the "exotics" under study. Any wild gardener who has ever introduced goldenrod into a meadow understands this perfectly. It's a lovely native wildflower, but it has to be controlled, or very soon, it will be the only wildflower in the garden. In recent years, the term "invasive" has become somewhat widespread like the many of the plants it describes, and perhaps the inherent alarm in the word has fueled the fire. After all, no one wants to be invaded! Botanically, the word simply means the plant being discussed, with favorable growing conditions, can be more stronger-growing than its neighboring plants in natural competition in the wild. So far, in some of our official literature, the term "invasive" has been applied to everything from the true rampaging pests like kudzu all the way to innocent garden plants that simply create expanding clumps as they grow. So when you hear or read the word "invasive" consider how it is being used. Because it's used in many ways. Here are some examples. Every gardener knows that certain plants grow and spread more strongly than others. Frederick McGourty, the famous garden writer, calls such plants "thugs." They tend to "take over." But he is speaking about his garden, not the landscape! Of course, a few flowers are what have been called "garden escapes", species that have "jumped the garden fence" and made themselves at home in our fields and along our roadsides. This is precisely how some kudzu-like species have arrived, but the huge majority of plants "jumping" garden fences may appear elsewhere, but cannot compete to the extent required to have any effect on our environment. Beyond simple garden "thugs", some species not only take over in gardens, they actually do spread more rapidly into the wild and tend to dominate certain habitats, such as nearby wetlands. The more these species dominate, the more serious they become. This amazing plant, native to Japan, was introduced into North America as an ornamental vine in 1876. Today, with its large leaves, attractive flowers, and large fleshy roots, the vine is well established all over the southeast west to Texas, and north all the way to Kansas. It is so rampant, it quickly covers nearby plants and smothers them to death, and has been known to invade whole forest areas, climbing tall trees and often eradicating them in the process. This species is one that is rampant here because it grows without its natural insect predators. Projects to reduce its spread are underway with hope of importing the correct insect species from Japan. This beautiful floating plant was brought into the United States, probably from Brazil, in 1884. Like many others, it was imported for its beauty, since with lovely rounded leaves and spectacular blue and yellow flowers, it makes a very handsome plant only about 2 ft. in diameter, floating on a pond or in swamps. The roots descend into the water, but do not root into bottom soil, like waterlilies. It simply floats, and drifts with currents or is blown by the wind. What the importers did not know is how fast it can multiply, and today canals, drainage systems and other waterways are totally clogged by this plant. Millions have had to be spent dredging it out of its watery habitats, creating true economic and environmental disaster, particularly in Florida. Still is spreads, and now clogs water courses from Florida to California. It has recently been spotted even in New York state. This is perhaps the most hated and best-known pest species. Another beauty, introduced from Europe in the mid-1800s and still admired by the unsuspecting, this is the tall purple-flowered plant that raises magnificent spires of color in wet spots and other places all over the northeast and now into the midwest. It has been spotted in over 40 states. This plant is a true wetland killer, spreading into low places, and quickly crowding out all our precious wetland species, and destroying huge areas of wildlife habitat. In just a short time, Purple Loosestrife makes any wetland a "single-species stand." Since it likes wet spots, it has spread very rapidly along highways, such as the New York Thruway. With its large drainage ditches lining the road, this interstate route is now lined during August with incredible bloom. This advancing, rampaging plant puts on a defiant show--brilliant purple in furious flower, as far as the eye can see. 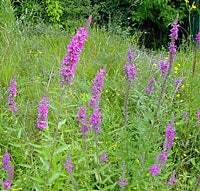 Purple loosestrife is one of the pests that spread rapidly by heavy seeding, and also from underground roots. Efforts are afoot all over its range to stop and try to eradicate it. Wildflower enthusiasts need to know it, and know it from its benign look-alikes. Many people confuse this pest with two of our valued native wildflowers: Fireweed and Blazing Star. Be careful when you identify this pest species, but when you do, do your part to eradicate the plants you encounter. There are some garden hybrids of Purple Loosestrife which are supposed to be sterile, but many experts suspect that they too are contributing to the problem. The Maleleuca story is very illustrative of how a seemingly positive plant can be introduced with disastrous results. These trees, which grow up to 50 ft. tall, are tropicals from Australia. The first ones were brought into Southern Florida just after World War II, and sold in nurseries as ornamental landscape trees. The handsome green canopy and especially the unique peeling bark (a lot like our native Paper Birch) made them popular. Before their true nature was known, and since the trees are columnar and fast-growing, they were unfortunately used as closely-planted windbreaks in some agricultural fields near the Florida Everglades. Today, we know all too well that this tropical tree loves swamp conditions, and it has devastated a large area of the Everglades, one of the unique wetland habitats in the world. Maleleuca grows so fast and seeds so prolifically, it now covers over 200,000 hectares of wetlands in South Florida, and is continuing its march into the Everglades and elsewhere. When the trees catch fire, the smoke is toxic. Wildlife habitat and other wetland species are lost. Worst of all, the trees seed themselves so closely, that what exists now is almost a living wall with only towering maleleuca trees, standing just a few inches apart. Long stretches of the Florida Turnpike west of Miami are lined with these "walls of trees", and of course, as they expand, nothing else survives. Florida is having to remove this menace by dredging, and so far, has reduced the spread by over 20,000 hectares, at huge cost. The tree is also establishing itself in Louisiana and Hawaii. The most important thing a gardener or landowner can do is to be well informed. Don't believe everything you hear, but be aware of the problems real pest plants can create. Be careful what you plant, and if you volunteer, try to direct your efforts against something important, like one of the true pest species.